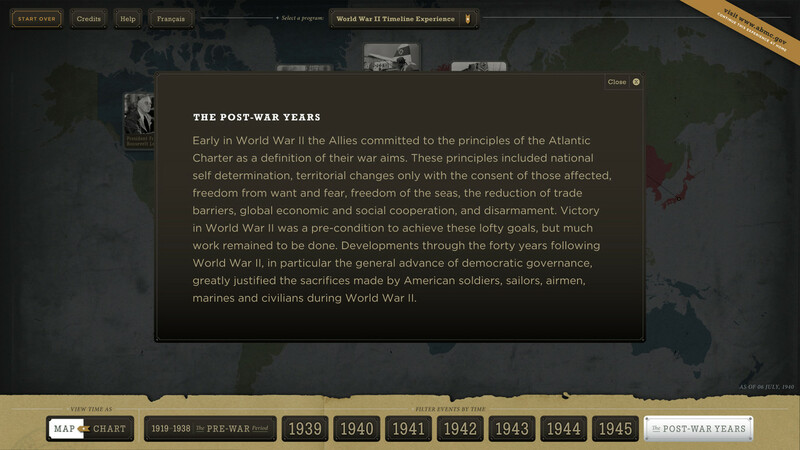 WWII Interactive Timeline (prototype) being demonstrated at Belle & Wissell's studio. 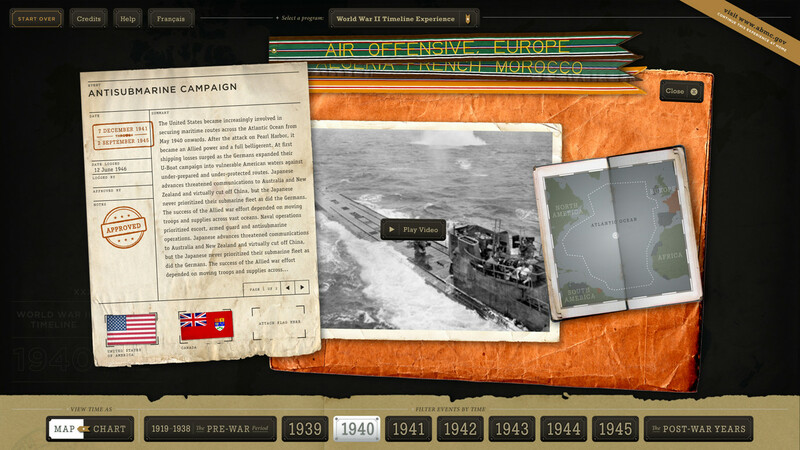 The main map interface illustrates that battles and campaigns were occurring on a global level. Event detail showing text overview, media player, and inset map. 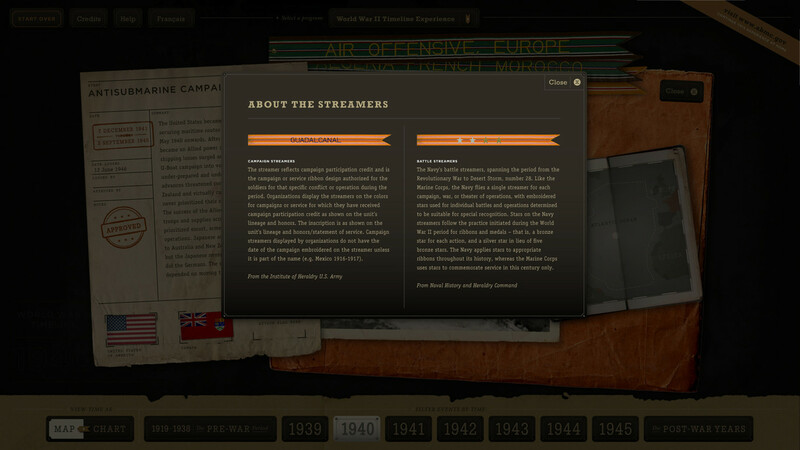 Information about the streamers used in the interactive. Informational overlay about the Post-War Years. Call to action to visit ABMC's website for more information about the visitor centers around the world. 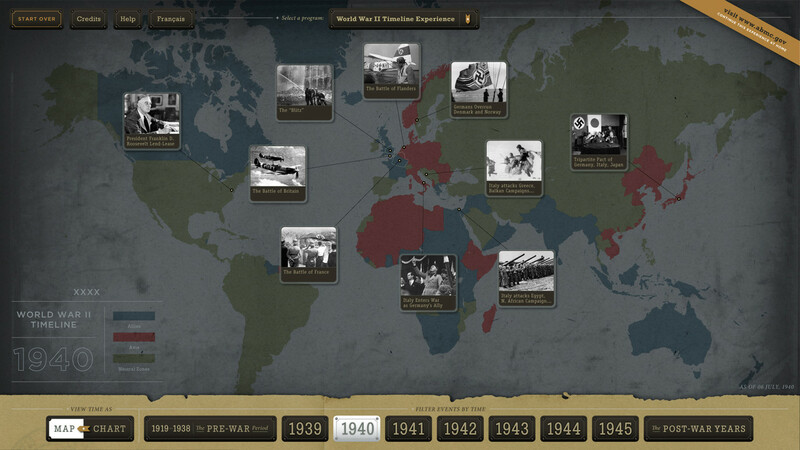 The World War II Timeline presents the battles and campaigns of the war visually on the world map, illustrating year-by-year that this was truly a world war. This project was produced in partnership with filmmaker Dog Green Productions. This project in it’s kiosk form is installed in every American Battle Monuments Commission (ABMC) visitor center across the world; honoring the soldiers who fought and died at those locations. In the future, this timeline will be accompanied with region-specific interactive experiences depicting the relevant battles and/or campaigns that occurred in that region of the world. The website version of this project serves as the overview and link to all of the specific battle and campaign intereactive experiences that are installed around the world. ABMC projects strive to tell accurate accounts of America at war through interactive battle maps, oral histories, soldier databases, and interpretive exhibits at U.S. military visitor centers around the world.